Rubber roofing is the ideal material for DIY projects around the home and garden. With unsurpassed longevity and 100% effective waterproofing properties, EPDM is the perfect solution for long-lasting, reliable shed roofing, garage roofing, green roof projects, ornamental garden ponds and much more. Homeowners typically steer clear of DIY roofing projects for many reasons. This might include traditional application concerns, working at height, lack of confidence in DIY skills, concerns about over- or under-buying materials and more. To make flat roofing jobs more accessible for home and business owners, Permaroof rubber roofing is highly supported in terms of ease of use, application resources, tools to assist with quantity purchasing and industry-leading EPDM application training courses. With Permaroof EPDM application training courses, any lack of experience or industry knowledge doesn’t matter. EPDM rubber roofing is a simplified system that requires only basic tools and cold application to remove the old concerns of handling hot bitumen or other heated application methods, such as the torch-down method used commonly on outdated felt or tar paper solutions. The one-day training courses are packed full of practical demonstrations of many aspects of flat roof application – including options for both liquid and sheet EPDM training (please select your preferred medium). Find out more about Permaroof rubber roofing training days. Lunch and refreshments are included in the day. DIY roofers can gain useful skills and these courses are ideal for those wishing to carry out several DIY projects at home. Every participant in the rubber roofing courses leaves with a basic knowledge of EPDM application and greater confidence in tackling this type of DIY project. EPDM rubber roofing is fast-becoming the trade roofing industry go-to material due to its increased longevity and performance compared to more traditional materials. Permaroof is delighted to be one of the largest licenced importers and distributors of Firestone RubberCover in Europe and holds huge stocks at our Derby-based headquarters and warehousing, which has just recently expanded. With heightened reliability, unmatched staying-power and a wealth of Permaroof support and resources, rubber roofing really is the way to go for all your DIY projects. Take some time to browse our resource library to find out more about EPDM rubber roofing today. Keeping gutters clear of debris can save the UKs homeowners £££s at the start of the year in gutter clearing and flat roof repairs. Most people must attend to gutters at some point during the spring to remove all the leaves, moss and debris that collects in gutters and clogs drains over the autumn and winter months every year. Once gutters become clogged, rainwater is unable to flow freely through the guttering system and drain away, and it inevitably pours over the top. This common issue leads to water ingress and damage to roof decking and eventually interior damage. This is when it begins to get expensive! Homeowners often do not notice there’s a problem until the water seeps inside the house or garden buildings, then emergency roof repairs are needed. Calling out a professional can be costly in an emergency situation. This is quite usual, as emergency call outs often mean that the roofing professional needs to move other work around and drop other clients to come out quickly to see you. Sometimes urgent calls are outside normal working hours, and these call out rates can be high. Tackling the job of clearing gutters yourself can be time-consuming, dirty and involves climbing a ladder and working at height. Not everyone is confident with working at height, and the cost of having a professional clear them year-after-year can soon mount up. There is another solution for homeowners in the GutterBrush. The GutterBrush is a clever innovation that uses a similar principle to a bottle brush, with polyurethane filaments wound around a central, twisted stainless steel wire core. The GutterBrush is available in 150mm and 100mm sizes and fits inside most standard gutters, whether box or traditional half-circle shapes. It can be fixed to gutters that are not standard sizes so is suitable for most guttering in the UK. How does a GutterBrush work? The GutterBrush sits in the gutter and is proud of the top. Leaves and other debris either stick to, and get caught by the filaments, preventing them from entering the gutter, or blow off the surface of the brush and away from the gutter. Water can easily pass through the filaments and continue down the guttering and drain downpipes with no obstructions. Using this type of debris filtering is also perfect for rainwater management systems, providing clear flow for water collection butts and preventing drain taps from clogging with leaves from the inside. Fitting a GutterBrush is fast and easy for trade or DIY homeowners. First make sure the gutters are clear of debris and water can free flow through the whole system. You may need to get a professional in to do this one last time! Once clear, the Gutterbrush simply slides into the gutter. Easy to join lengths of Gutterbrush are pushed into the gutters and can be attached at either end using the wire filaments left. A simple twisting motion will join the brushes together job done! This simple, yet extremely effective idea has changed the way homeowners all over the UK are tackling the issue of their clogged guttering and rainwater systems. The GutterBrush is expected to last for many years and carries a guarantee for 10. Join the Gutterbrush revolution and keep those gutters clear and clog-free. Look after your guttering and it will take care of your flat roof, reducing instances of emergency roof repairs and saving you money over the long-term. Check out the GutterBrush here – buy online with next day delivery from Permaroof. As spring approaches, homeowners across the UK are beginning to think about tackling those jobs that the winter months have created outside. This may include getting the shed or garage roof replaced with new rubber roofing. Rubber roofing offers some great benefits for the flat roofs of the country’s domestic and commercial buildings. But where is the best place to buy rubber roof systems that can outperform the traditional flat roof materials of yesteryear? Rubber roof suppliers are numerous around the UK, but PermaroofUK Ltd offer the widest selection of genuine Firestone EPDM roofing. The company remains one of the country’s largest licenced importers and distributors of Firestone EPDM and accessories. Buying from Permaroof also offers homeowners the largest selection of flat roofing resources available online for free. With an extensive video tutorial library, a huge array of downloadable PDF installation guides and industry-recognised rubber roofing training courses, Permaroof can help both professional and DIY roofers get the job done fast. Permaroof has also introduced the EPDM flat roof kit. The kits have proven to be perfect for DIY roofing projects at home, such as shed roofing and garage roof replacement. The rubber roof kit includes everything you need to create a professional finish and removes the worry of over- or under-buying materials. Find out more about rubber roofing kits now. EPDM membrane is a high-performance alternative to traditional flat roofing such as felt or tar paper. Manufactured from synthetic rubber polymers and carbon black, EPDM is the best example of rubber roofing available today. It has high UV resistance and offers 100% waterproofing over its incredible expected lifespan of more than 50 years. Permaroof has been supplying the nation’s trade and DIY flat roofers for almost two decades, and with next day delivery and award-winning customer service and sales values, really is the best place to buy rubber roofing in the UK. Visit the Permaroof online store today to buy your rubber membranes and EPDM accessories with confidence. The EPDM flat roof system offers DIY homeowners an excellent opportunity to tackle historically tricky roofing projects yourself. Why? Let’s take a look at some of the biggest benefits EPDM flat roofing brings to DIY. EPDM flat roof systems are available online in kit-form to give homeowners the chance to forget about the challenge of ordering the right amount of kit. Professional roofers use knowledge and experience to work out materials quantities and this has traditionally been difficult for the DIY sector. Buying a standard-sized kit means that all you need are your basic building measurements (measure twice). For sheds and garages, this is often super-easy as they already come in standard sizes. So, if you bought an 8m x 4m shed, you simply choose an 8m x 4m flat roof kit. All the membrane is cut-to-size, including enough overhang, and adhesive and trims are often included to make it as easy as possible to order. Some EPDM flat roof system providers can also give you industry-leading training in how to apply your membrane. Permaroof UK Ltd run weekly training courses in both EPDM sheet and Liquid EPDM application. Training is affordable and the one-day courses are intensive. Find out more about Permaroof EPDM flat roof system training. EPDM flat roofing membrane is superior to other types of roofing material and has an expected lifespan of over 50 years. For most domestic flat roof projects, this means that once it is fitted, the likelihood is that you will not have to do it again, especially in shed roofing, as the membrane will almost certainly last for longer than the shed itself. This is ideal for DIY homeowners. Fit once and relax, knowing that maintenance beyond regular visual inspections is unlikely. In the event that EPDM becomes damaged, such as following high winds and debris falling on the membrane, it is fast and easy to repair. The EPDM flat roof system is by far the best for the DIY sector, and Permaroof provides a wide range of industry resources for free to help with installation if you do not need any training. Visit our resource centre to review the installation guides now. Can Your EPDM Supplier Offer You Industry Resources and Support? When tackling DIY roofing projects, most homeowners need support and the benefit of resources to help with installation. Finding an EPDM supplier that can offer these valuable resources is always a bonus, but they are thin on the ground. Permaroof UK Ltd is an exception. The Derby-based EPDM supplier offers the widest selection of industry resources, from video tutorials to downloadable PDFs containing detailed information and professional images to point you in the right direction. Not only does Permaroof offer these resources and support, but they are also free of charge for anyone, regardless of whether you are a client of Permaroof’s. The company are committed to the provision of customer service and are award-winners in that respect. Every month, Permaroof add new industry resources, technical information, safety data sheets and white papers for both trade and DIY homeowners. Permaroof is one of the UKs leading EPDM suppliers, with an extensive range of EPDM membranes and associated supplies. The introduction of the flat roof kit has been a huge benefit to the DIY sector, as everything is included and the guesswork about quantities is negated. The EPDM supplier also offers the best trade support in the flat roof industry, with contractor opportunities ranging from partner benefits to EPDM training, certification and addition to the nationwide contractor network, giving trade flat roofers the chance to gain recommendations for local roofing work. The company has an exciting expansion plan and recently acquired the Skylight Company, now providing a range of stunning flat roof skylights to bring natural lighting benefits to all types of roofing projects. With further plans for expansion into the newly-acquired additional warehousing space, Permaroof is still on-the-up and invites trade roofers to join them as business goes through the roof. If you’ve been searching for an EPDM supplier that is prepared to go the extra mile to provide support for both trade and DIY roofers, look no further than Permaroof. Happy New Year to all our readers! Permaroof EPDM supplier hopes that this year will prove successful for flat roofers all over the UK. We’ve got a great range of special offers to kick-start the year and have plans to add to our already-packed resource library of flat roof installation guides, data sheets and technical info to give both trade and DIY roofers even more to add to your toolboxes. 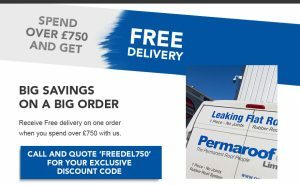 The latest special flat roof offers are available for the whole of January in the Permaroof online store and with reliable next day delivery, you can get started straightaway. 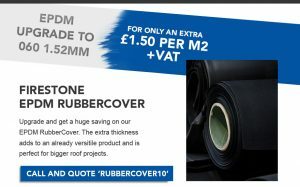 With the promo code ‘RUBBERCOVER10’, upgrade to premium grade EPDM flat roof membranes for just £1.50 per square metre (+VAT). If you’ve never used the ProAqua Gutter system, you don’t know what you’re missing. Get 15% off your first order today while stocks last. 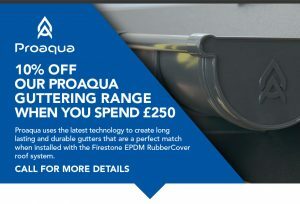 Take advantage of these great offers before the end of January from the UKs leading EPDM supplier. Permaroof EPDM supplier is also a leading, Firestone-approved EPDM training specialist with a purpose-built training centre in Derby. This year promises to be one of the best years for training, with exciting opportunities for trade roofers to become a Permaroof approved contractor. Our contractor programme offers a wide range of benefits for a limited number of regional EPDM roofers, including genuine business leads, vehicle financing offers, branded website and much, much more. Talk to Permaroof EPDM supplier today to find out more about how to boost your business in 2019 on 01773 441 947 or email us for further information at [email protected]. Looking for last minute EPDM roofing deals? Permaroof UK Ltd has some great offers for their customers before the end of the year! EPDM roofing products from Permaroof offer homeowners the chance to take advantage of the high-performance of EPDM membrane at the best prices online all-year-round. To make a real difference at the end of 2018, we have some additional deals! What’s in store for Permaroof shoppers? 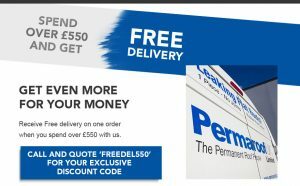 Throughout December 2018, Permaroof shoppers can get free delivery on one order over £500 – simply by adding the code FREEDEL500 at the checkout if you’re buying online, or over the phone if ordering direct. There’s also a free delivery for one order over £700! – enter FREEDEL700 to qualify. Huge savings also continue for your EPDM adhesive. This month we are discounting our popular 17kg cannister of Firestone Spray Contact adhesive – just £165.00 +VAT with the code FIRESTONE165. You can also take this opportunity to get 5% off your favourite Firestone Bonding adhesive in 2.5l, 5l and 10l tins with the code BONDING25. Head on over to the Permaroof online shop today to take advantage of these last minute EPDM roofing deals. With just a couple of weeks left of the year, Permaroof knows that ‘every little helps’ when you are planning ahead for your business in the new year. While we mention planning ahead, did you know about the Permaroof contractor licencing programme? We are offering successful applicants the opportunity to work alongside Permaroof, the UK’s largest approved distributor of Firestone EPDM membranes and supplies. What better way to expand your flat roof business in 2019? Working with Permaroof UK Ltd gives roofing businesses greater opportunities than ever before, with subsidised pricing, great financing deals for vehicles, unmatched industry experience and knowledge as your support network and much more.